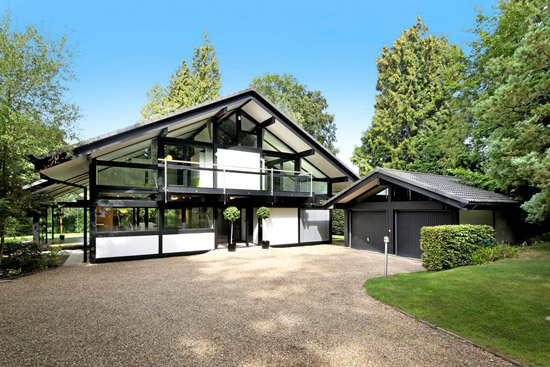 The competition to win one is still open, but if you miss out, you can opt for this Huf Haus property in Ascot, Berkshire. 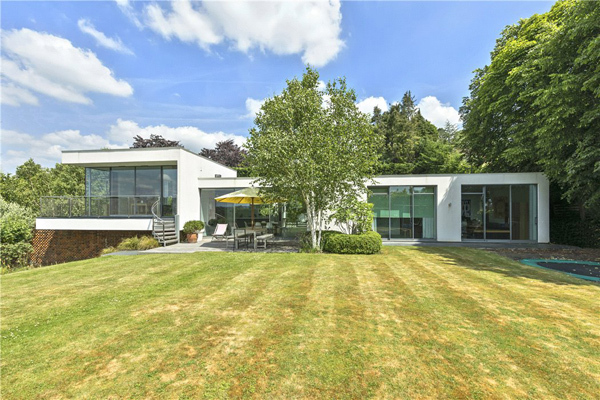 Our Huf Haus section is becoming a bit of a UK map for these particular German properties due to so many being featured. Why so many? Well, they are always incredibly popular when I put one on the site, so if I see one, I try to feature it. 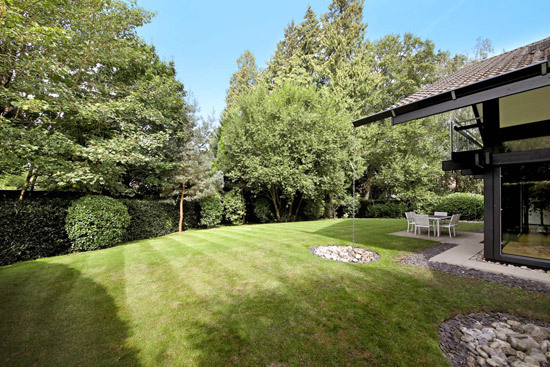 This one is in a sought after location, with the agent describing it as a ‘highly regarded road’ as well as a a private ‘tucked away’ location, set behind electrically operated gates and approached via a gravelled driveway. 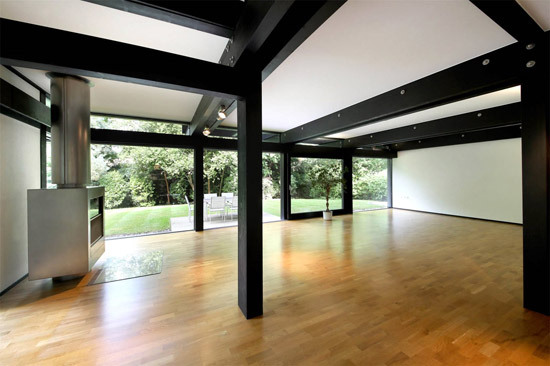 When you do approach it, there’s no mistaking this for anything but a Huf Haus. 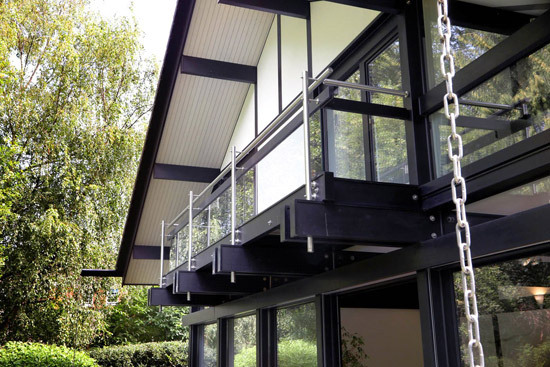 As you probably know, the Huf Haus is a design and build concept out of Germany, producing prefabricated homes inspired by the Bauhaus movement. 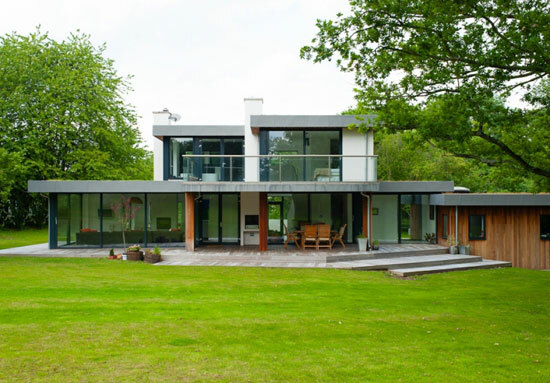 They were a little ‘under the radar’ in the Uk until one featured on Grand Designs some years back. 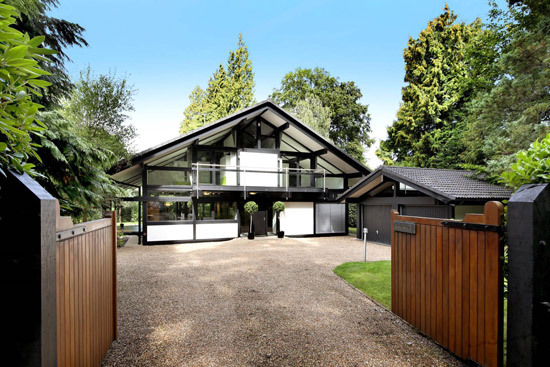 After that, there was a mini boom in Huf Haus builds and as a result, the German company has designed and built several all over the UK, many of which have come onto the market in recent years. 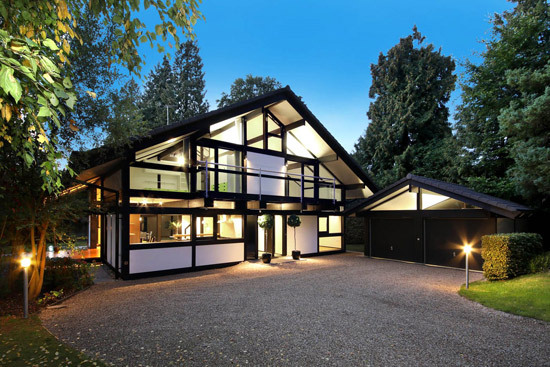 This one is the most recent, offering all the trademarks of the typical Huf Haus. That includes open, flowing living space (including a double height reception), the beams, the balconies and of course, the walls of glass. What you possibly can’t see are the premium finishes and the craftsmanship. 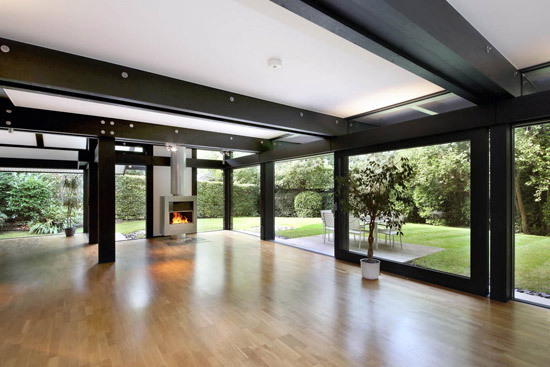 Every Huf Haus is made and built to exacting standards, with this one also offering sound-proofing, under-floor heating, windows with insulating glass, electrically operated window blinds and plenty of built-in storage, including the loft. 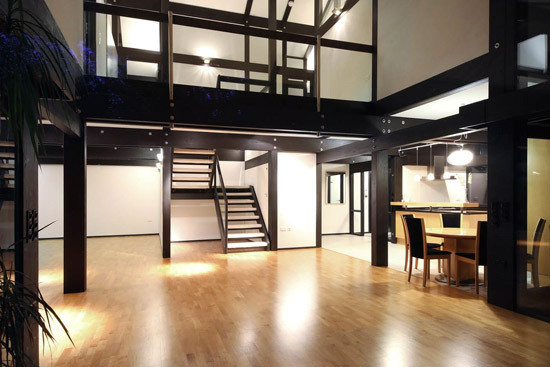 This one offers 3,371 sq. ft. of living space, with the entrance opening into a vestibule that leads through to the principal rooms. 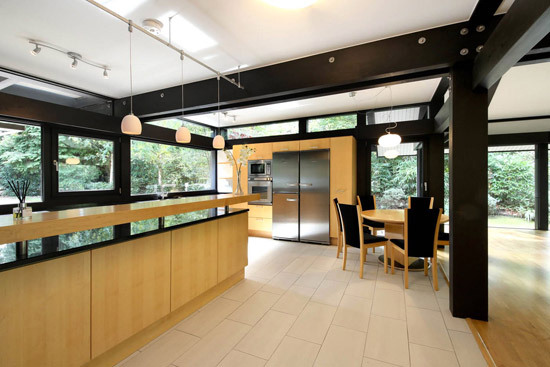 The open-plan sitting room, dining room and kitchen/breakfast room are on the ground floor, with a contemporary wood burning stove adding a focal point to the reception space. There’s also a large sliding door opens the room out to a paved patio and the kitchen area is fitted with all the high end finishes and appliances you would expect of this kind of house. Also located on the ground floor is a study, a guest bedroom with an en suite shower room and a cloakroom. 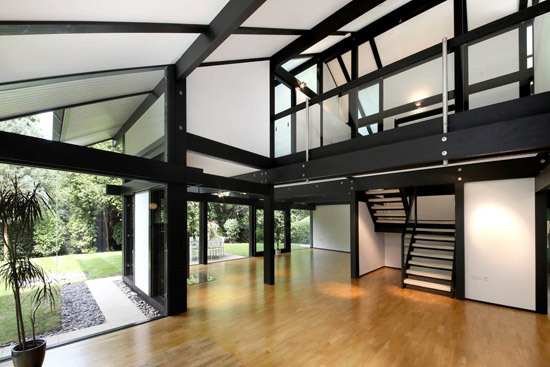 A central staircase goes up to a galleried landing on the first floor, around which the bedrooms are arranged. The master bedroom has an en suite bathroom, a walk-in wardrobe and direct access to a balcony, while the other three bedrooms are described as ‘well-proportioned’ and with access to balconies. 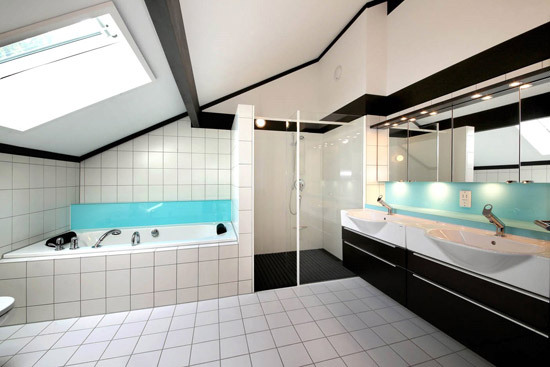 Finally, there is a family bathroom with separate shower and bath. 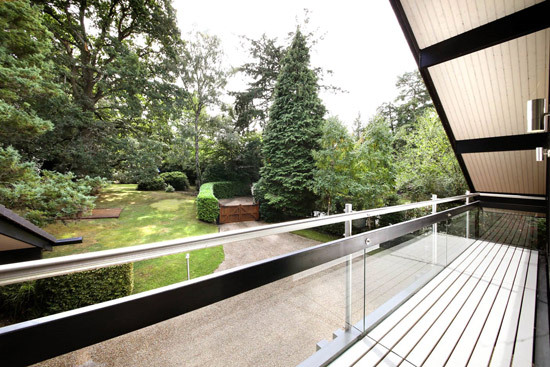 Outside space too, which is made up of landscaped gardens and a separate double garage. 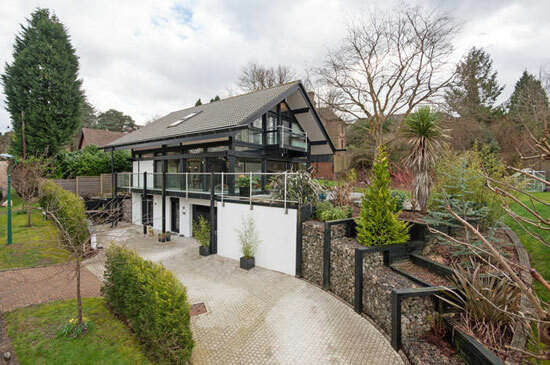 Of course, it doesn’t come cheap at £1,950,000, but if you win the Lotto this week, you know where to look.